So here we are again, the middle of March and entering in to that strange quiet cinematic period between awards season and Summer blockbuster season. Though sifting through the eccentric foreign affairs, below par British offerings and mish mash of delayed 2014 American releases in the UK can sometimes be an unrewarding task, it would be fair to say that more often than not I come across a film or two between now and July that tend to find their way on to my top ten of the year list. 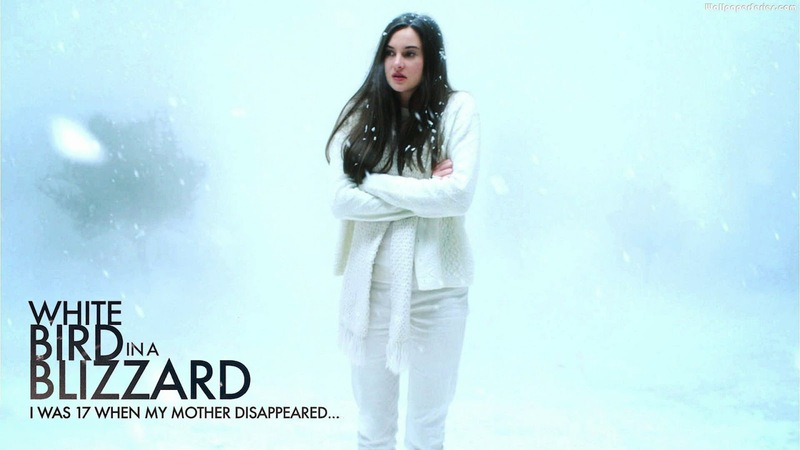 First up in no man’s land was White Bird In A Blizzard. A big screen adaptation of the 1999 novel by Laura Kasischke and one part mystery disappearance, one part teenage sexual awakening, White Bird In A Blizzard provides a long form look in to the life of young adult Kat Connors (Shailene Woodley) as she strives to live with some semblance of normality after the sudden vanishing of her mother Eve (Eva Green) when she was seventeen years old. Set originally in 1988 and spanning the course of three years, the audience follow Kat from the day her mother disappears to the day her closure (no spoilers!) is finally achieved, with plenty of classic coming-of-age tropes along the way including sexual experimentation, adjusting to college life and her somewhat awkward relationship with her wet blanket father Brock (Christopher Meloni). Of course, intertwined with this run of the mill bildungsroman melodrama is the intriguing mystery of Eve’s disappearance, and in exercising this joint-genre approach between mystery thriller and coming-of-age drama, the filmmakers have achieved an effective portrayal of what living with such a disappearance must really feel like. Though the memory and lingering mystery of Kat’s mother is always in the back of her mind, she nevertheless indulges in all of the expected experiences of a teenager, and overall the film gives a more interesting nuance to the subject of missing persons, with others exploring the topic that focus solely on the details of the case without portraying the fact that the characters lives must go on regardless. As with all cinematic vanishings, the key delight in such narratives is in the viewer themselves playing detective, and White Bird In A Blizzard indulges this delight with a number of possibilities for Eve’s potential whereabouts. Though, as previously mentioned, Kat’s life post-disappearance constitutes much of the film’s subject matter, the filmmakers know that it is the promise of scandalous revelations on Eve’s behalf that has kept the audience engaged, and in my opinion the tale’s conclusion is certainly no disappointment. The film as a whole may not be as twisty or as finely polished as something like Gone Girl or Gone Baby Gone, it certainly provides enough entertainment to satisfy the crowd and its interesting, more relaxed approach to the missing persons genre is really interesting to experience. Though White Bird In A Blizzard’s plot alone is enough to spark interest, the performances by the film’s two central female characters are what really make it a picture to recommend. Shailene Woodley commands the screen as Kat, a strong willed character whose innate allure proves effective both in her sexual awakening and in her ability to make something of her life as her family falls apart around her. Woodley appears to be following in the footsteps of Jennifer Lawrence in making excellent smaller film choices whilst being the face of a young adult franchise juggernaut (the Divergent series), and though Lawrence has a few years and a few serious awards over her, it seems as though Shailene could be a strong competitor in years to come. Eva Green as the deliciously unstable Eve is vampy as hell and having an absolute ball. The entirety of Green’s onscreen work is portrayed via flashbacks to help the audience understand what life in the Connors household was like before the disappearance, and from start to finish she is giving her very best Faye Dunaway as Joan Crawford in Mommie Dearest, a mother who, for reasons unbeknownst to the audience, has become dissatisfied with her suburban life and has decided to take it out on her young, beautiful teenage daughter. For someone like me who revels in an unabashed spot of expert actress scenery chewing, Green’s performance is immensely enjoyable, but I can understand some criticism’s of her acting verging on hammy at times. The relationship between Kat and Eve is strained at its best and abusive at its worst, and Woodley and Green are irresistible to watch together as an unconventional yet believable mother/daughter duo. Overall, White Bird In A Blizzard is a solid mid-March type drama that offers something a little different in terms of its biting edge and split genre approach. Yes, it is certainly melodramatic in parts and yes, it is perhaps not the most complex and out there mystery in modern cinema, but the engaging and enigmatic performances by its two leading ladies make the picture a real treat to watch. Highly recommended for fans of female driven drama but also pleasing for its intriguing narrative puzzles and unsettling atmosphere. I’m keen to see this but will have to wait a month or two for my local arthouse place to get it by the looks of things. Have you seen anything else by Gregg Araki? I haven’t actually! Considering giving Mysterious Skin a go though. Ah ok – I haven’t seen any, maybe I’ll start with this one! Not heard of this one but it sounds great!